Please refer to our stock # 8412 when inquiring. 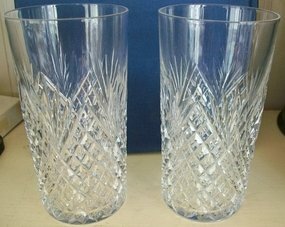 Pair of Magnificent American Cut Glass Tumblers, c. 1890. Pineapple and fan pattern. Heavy and feel good in your hand when you hold them. Perfect condition and the glass is as clear as a bell. 5 inches tall.